This lovely garden could have been anywhere, but it happened to be located in the Buckingham Palace Gardens. I was so drawn to these flowers while photographing them, I missed the Buckingham guard riding their horses along the road in the background. I didn't notice them until I was home and started to work through the design of the painting. 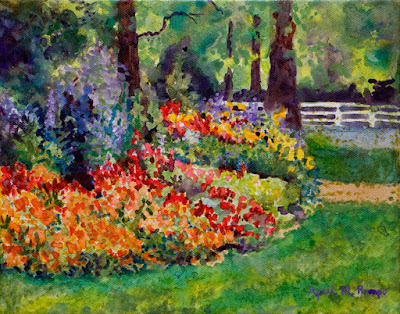 Since the color combinations the gardener selected is what drew me to the scene, I decided to discard the men on their horses and focus on the color. To recreate the thrill I felt looking at this garden, I used triad leaf green, cobalt violet, and cadmium red light(hue) for the lighter shades; and a dark triad of a blend of Quinacridone Burnt Orange and Phthalo Blue for the dark green, Dioxazine Purple for the dark purple, and Permanent Alizarin Red for the dark red. A few touches of Quinacridone gold complement the lavender and purple hues. 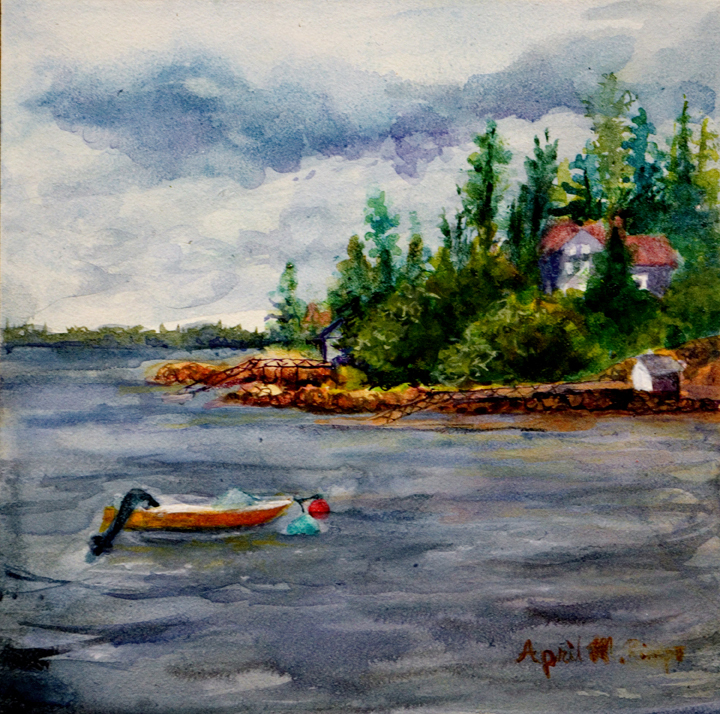 Working plein air - "Solitude", "Windy" and "Harbor Bait"
I am without a question a studio painter, but about once per year I venture outside to paint plein air. I traveled with four friends to Maine, where we rented a house for a week with the intention of painting plein air most every day. We started out strong. 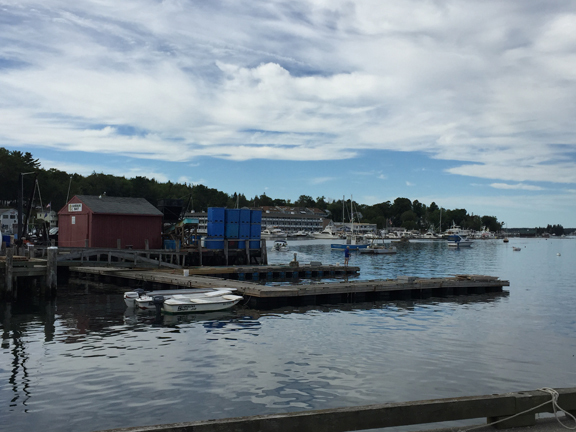 First meeting with a someone who paints in this area for four months each summer to find out the "best spots" for plein air painting. 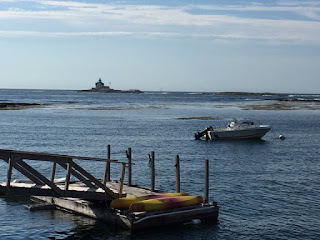 She had quite a few suggestions, so we headed out our first day to explore the Cuckolds Island lighthouse in Boothbay Harbor. I don't think I was the only one to be surprised how far offshore this lighthouse is from the public wharf, but it just seemed right to me to be the first thing I painted on this trip. I did feel like having binoculars might have helped to see, but I think it freed me from worrying about the details, which are somewhat superfluous when painting outdoors. 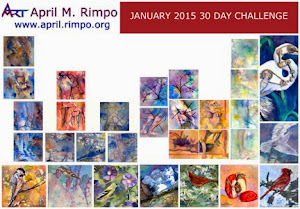 Plein air painting all about simplification and capturing the moment. By lunch time Solitude was complete. As you can see I took liberties by adding the colors of sunrise to give the scene some spark. The teal blues were visible in the sky and water, although you can't seem them in the photograph. 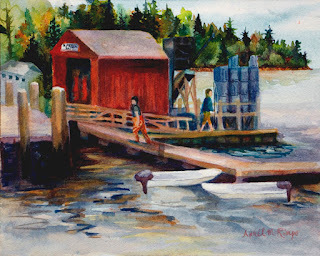 After lunch I moved out on the dock to paint another scene. The wind decided to come up that afternoon, first blowing my hat off and later whisking my water container off my palette and onto the dock. 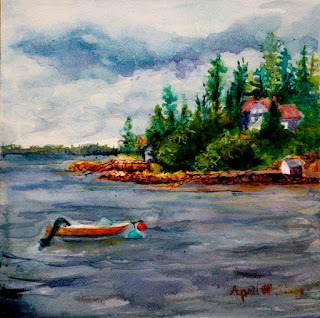 Although my partner-in-crime, who was also painting on the dock, decided to head back in where there were houses to block the wind, I persisted. I was working on a 6" X 6" Aquabord and was determined to get it done. Windy is the result. Working on Aquabord is quite different from painting on watercolor paper. It requires a lot more layers, so the result looks a lot more like an oil than a fluid acrylic. In just a couple hours the water had changed from the lovely warm and teal blues we saw in the morning to gray with lots of rough water caused by the wind. It has always been amazing to me how some plein air painters even paint in the snow to capture the moment. I guess my windy experience showed me how an artist can get pulled into dealing with the weather to make the painting happen. Another day we ventured to the local fisherman's wharf. This part of the harbor was thick with boats, buildings, and houses along the shore. Equipment and storage containers littered the docks. It was overwhelming. The image at right shows the scene before me while I was painting. If I was an experienced plein air painter I would probably select one or two boats and paint those, but the studio painter in me wanted more. I spent nearly an hour creating a sketch of the scene and then another half hour transferring it to my watercolor paper. By the time I started to paint, several of my comrades had made great progress on their paintings. 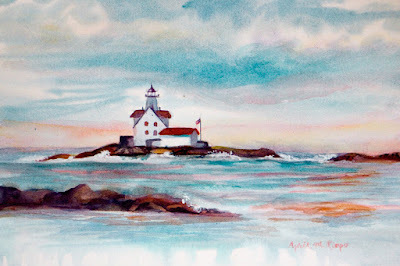 The woman who paints in Boothbay each summer joined us that morning and completed her painting in the time it took me to get ready to start painting. My "simplification" was to only eliminate the boats and buildings along the shore in the background. I chose to add people who were on the dock at various times while I painted. By the time we stopped for lunch I was nowhere near done, so I worked on it back at the house off and on for a couple days to finish this up. As you can see the immediacy associated with plein air work is NOT apparent in Harbor Bait, but it was still fun to get it started on site. Exhibited in Watercolor Art Society - Houston's 40th Annual International Water Media Exhibition in 2017. Years ago I took a tour where the guide was entertaining, very informative, and a bit of a showman. I really enjoyed his talks every day. 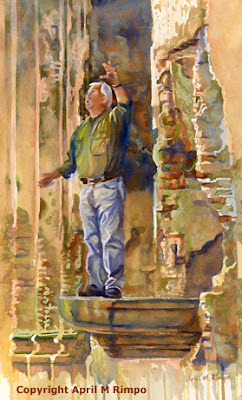 One day we went to the ruins of a church, he jumped up on a ledge and started to talk, waving his arms to point out bits of the architecture. All that came to mind was that he could have been an orator in days long gone, creating excitement in the crowds before a big event. I took several photographs and suspected that some day he would become the subject of a painting. Well, it finally happened. I used a beautiful tertiary triad of Spring Green, Cobalt Violet, and Cadmium Orange to create The Orator. I love the result of using this soft color palette and hope you do too. In a few areas I used a bit of Quinacridone Burnt Orange with Dioxazine Purple to create some of the darkest values that I felt were needed to create the depth of shadow behind the figure. These colors were like a darker version of the colors in the triad so the result felt cohesive.